I'd say Ah Teng's serves good cake. Good mousse cake probably would be more exact. They aren't mind-blowingly creative concoctions, nor would they induce mid-day subconscious cravings. But they are light enough to satisfy the weight-conscious, rich enough to leave a lingering sweetness on the palate and discreet enough not to overpower the flavours of the meal before. So yes, this is solidly good cake, and my security blanket in the mousse cake world. Can't say the same for their other offerings though. The other day, I was most disappointed by the Chocolate Grotti (pictured above). It tasted OLD! I found that rather offensive actually, particularly coming from the Raffles Hotel. 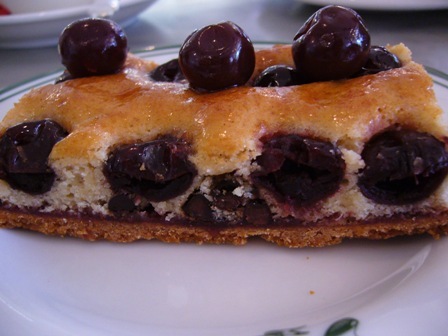 The liqueur in the cherries had all but evaporated, the pastry was crumbly and dry, and the chocolate, didn't even get a hint of that, really. Tsk. Not good. The lapis cake (Malay layer cake) was similarly tasteless.